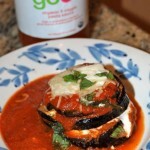 I love eggplant and my husband doesn’t – what’s a girl to do? So when my mom came for a visit I made this for our dinner. DELICIOUS! It’s so easy to make, so healthy and bursting with fresh summer flavors. I don’t grow my own eggplant (maybe next year? ), but I do get them from my local organic crop share. I recommend picking a smaller, organic eggplant for this recipe. The eggplant is perfectly paired with our sweet &amp; tangy Garden Good Pasta Sauce. Enjoy! turn on broiler to 450 degrees. slice eggplant thin (1/4-1/2 inch). sprinkle salt on raw eggplant and let set 10 minutes on paper towel covered plate or pan. then brush eggplant with olive oil on both sides, place on cookie sheet. lightly pepper. place in oven and roast for 8-10 minutes per side. eggplant should be golden brown. in an 8x8 baking dish, spread 2 tablespoons of mama jess garden good sauce, place an eggplant slice, then a thin slice of mozzarella. repeat: sauce, eggplant, mozzarella. top with a sprinkle of parmesan cheese.